Thursday night: Rain ends, clearing and windy. Lows in the 30s and 40s. Friday: Mostly sunny, windy. Highs in the 30s and 40s. Saturday: Clouds increase, late showers. Highs around 50. What a day! We started off our Thursday with snow into far northern New England, especially into the higher elevations. Madison, New Hampshire reported 2 inches of snowfall by midday and snow even accumulated on roadways according to the New Hampshire Department of Transportation, which allocated crews and plows out to keep the roadways safe. In parts of Connecticut, they saw a thunderstorm by the early evening that created gusty winds and pea-sized hail, followed by rainbow sightings after the thunderstorm weakened. The steady rainfall over eastern New England will subside through this evening, with a partial clearing of the skies through the overnight hours. As the system slides into the Gulf of Maine and eventually off toward our northeast, we'll be on the backside of this system, allowing for the cold, northwesterly flow to slide in. A few bands of snow showers will linger into early tomorrow morning along the Canadian border and along the spine of the Green Mountains in Vermont. Southern New England, skies will be clear for Friday morning’s commute, meaning plenty of sunshine, but a cooler start with lows overnight slipping into the lower 30s. For Friday afternoon, under a blanket of sunshine, high temperatures will be into the upper 30s north, mid to upper 40s south, but it will feel slightly cooler than the air temperatures with a slight wind chill as winds will be out of the northwest at 10 to 25 mph. We see a brief break in the active weather pattern for Friday, but by Saturday mid-afternoon, we’ll see rain sliding in from the west. High temperatures will reach near 50 degrees Saturday as a warm front slides in along with the showers, but overnight Saturday night into early Sunday morning, a cold front will sweep in. 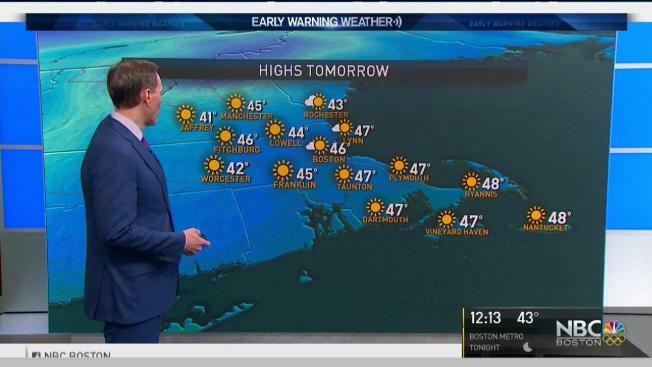 The cold front will not clear the area until late morning Sunday, so even though the high temperature for Sunday reads as upper 40s, that will likely be observed in the morning hours and then temperatures fall into the afternoon back into the lower 40s to 30s as a wintry mix is possible into northern New England by the afternoon. By Sunday evening, the showers will have cleared out of southern New England, but lingering showers will remain in far northern Maine, Vt., and N.H. by the Canadian border. As we start off the shortened work week for most as we get closer and closer to the Thanksgiving holiday, Monday will likely be the coolest day with highs near 40 under plenty of sunshine. Tuesday and Wednesday, highs will be into the mid to upper 40s with a chance for a clipper system to slide in from the Midwest that could bring a few flurries to northern New England Wednesday and a few rain showers along the coastline Wednesday. Cooler air slides in by Thanksgiving across New England with highs into the lower 40s south, near 40 north. For Black Friday and the following weekend, temperatures will remain in the mid to upper 40s with a chance for showers, but we’ll keep an eye as we get closer.